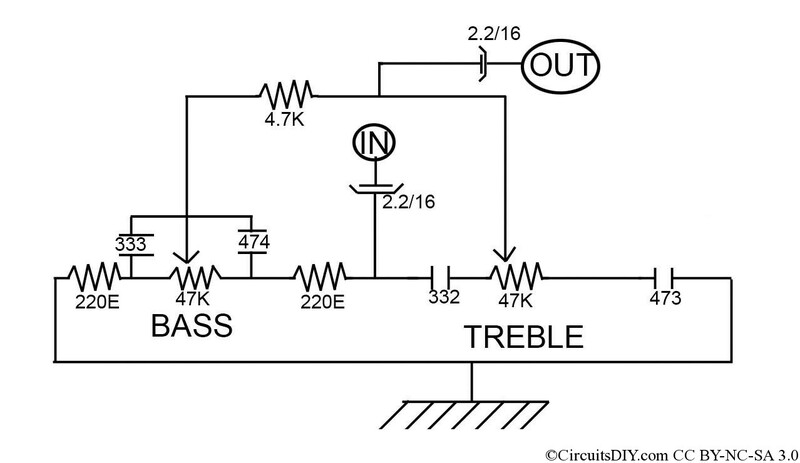 This low cost bass treble circuit consists of some capacitors, resistors, and two T/C pot for BASS and TREBLE control. this circuit can be made without even a veroboard. You just solder components as this circuit network is not so complex. It has only two-pin parts. Let’s take a look at he circuit diagram. Nothing to say about it, as it is so simple that a beginner level hobbyist can even understand and build this circuit. But there are some -ve points of this circuit which I must say, after giving you the circuit. As no external power supply, the O/P power is much lesser than I/P power, so volume decreases. I want a 4440 ic amplifier circuit diagram. with printed pcb diagram. There also left right input output and bass treeble. Pls send me to my email id. i want to make it in my home. I want a monaural circuit board with Volume, Bass and Treble controls. The purpose is to improve the hearing of a 92 year old (that’s me). I am going that way because I found that putting a transmitter and a head set between the TV and my ears improves my hearing way beyond the performance of Siemens’ best hearing aid. I did that things like that as a hobby, but now I prefer to buy the finished product. This is an experiment to which if it works could be worn on a belt together with a mike and an earpiece in the good ear.